PlayerUnknown’s Battlegrounds continues to be one of the most surprising and popular multiplayer experiences of the past year. Even myself, a relative skeptic of the battle royale formula, found myself jumping into Erangel at least two or three times a week. It’s an addictive rush, either as a survival-horror single-player experience or the more tactical and freeform squad-based play. As you might expect, when the second play-area was announced, I was intensely curious about how it would recreate the experiences of the first. Erangel, the game’s first map, is a sprawling, eastern European pastiche of an island, bordered on all sides by water. It’s a design that takes its lineage back to PlayerUnknown’s Battlegrounds’ ancestor, ArmA 2, and its popular map, Chernarus. Erangel was clearly designed with Chernarus in mind. The two maps share not just an aesthetic resemblance but also a design one—many of the landmarks and cities in Erangel are implicitly or explicitly taken from Chernarus. 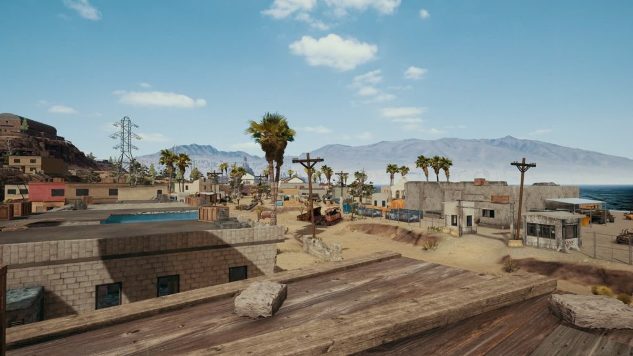 What makes the new map, Miramar, so fascinating is that, for the first time, we’re seeing a design specifically for PlayerUnknown’s Battlegrounds in its current competitive state. Erangel, while iterated upon during development, was more or less locked into its current design back when the game was in pre-alpha, around September of 2016. While small updates have been made to Erangel, Miramar is an entirely new gameworld, both aesthetically and within the allowed constraints of the Battlegrounds model. This means that Miramar could be designed from the ground up to explore new ways to interact with the battleground itself. A few months back, I lamented how most of Erangel feels like a paintball stadium, tactically interesting but without much implied meaning in its spaces. Miramar is different. It retains the tactical opportunities afforded by varied environments, but it pushes them much farther than was possible in Erangel. Miramar has towns wrecked by fallen planes and farmhouses destroyed by jeeps that ran through its walls. The cities are denser, and feel more realistic in their layouts, with buildings crawling outward from central hubs in the desert. The desert is more desolate and more open than Erangel’s fields, and dotted with hills making each ridge a new danger to watch out for. Unique buildings abound, from the casino in Pecado, to the sprawling desert mansion of Hacienda Del Patron, to the prison that serves as both the map’s staging area and a fascinating encounter zone during combat. Most of all, Miramar feels designed in a way that Erangel simply couldn’t be due to the timeline of Battlegrounds’ development. It’s purposeful, and laid out with care to each encounter area. It feels less copy-and-paste in regards to its building types and encounter layouts, with new environmental assets in almost every area. With Miramar, PlayerUnknown’s Battlegrounds is finally feeling like a true evolution of the battle royale formula, no longer the haphazard shooting galleries of its predecessors. Let’s hope future maps maintain this degree of innovation.